Japan’s Kasumi Ishikawa and Mima Ito have been crowned Women’s Doubles champions at the Seamaster 2017 ITTF World Tour Asarel Bulgaria Open, after registering a victory over the mixed nationality pairing of Matilda Ekholm and Georgina Pota in the final of the event which was hosted on Sunday 20th August. 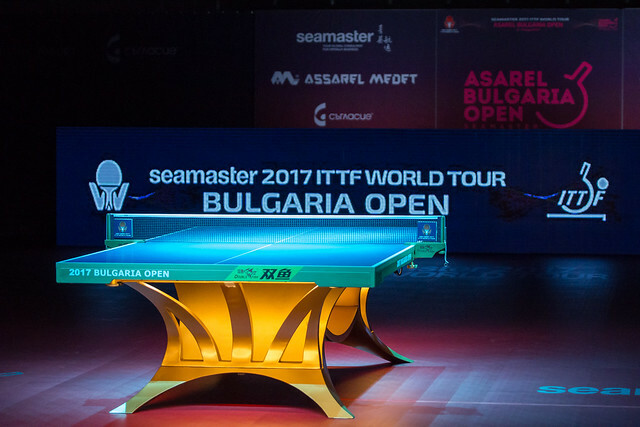 Featuring the second and fourth seeded pairs in action, the Women’s Doubles final was a hotly anticipated encounter in Panagyurishte as both partnerships entered the match off the back of positive campaigns at the Seamaster 2017 Bulgaria Open. Sweden’s Matilda Ekholm and Hungary’s Georgina Pota have become a very solid partnership in recent times and were aiming to win their second Women’s Doubles gold medal of the year having achieved success as a pairing at the Seamaster 2017 India Open in February. However, reaching the top of the medals podium proved one step too far for Matilda Ekholm and Georgina Pota as the lower seeded duo of Kasumi Ishikawa and Mima Ito emerged triumphant. The final actually began better for the mixed nationality pairing of Matilda Ekholm and Georgina Pota who came through the opening game by a five point margin, but Kasumi Ishikawa and Mima Ito responded well claiming three consecutive ends to reach the top step of the medals podium (11-6, 8-11, 9-11, 5-11). Victory in Panagyurishte marks the first occasion Kasumi Ishikawa and Mima Ito have won a Women’s Doubles title as a partnership on the ITTF World Tour. Matilda Ekholm and Georgina Pota have made four appearances in ITTF World Tour Women’s Doubles finals as a partnership, winning trophies on two occasions.